The contact between Colin Chapman and Giorgetto Giugiaro which resulted in Guigiaro’s design work on the Lotus M70 project goes back to April 1972. At the time Giugiaro was engaged on the interior design of the M50 (Elite) for Lotus, the final proposal of which he sent in the July of the same year. This was the beginning of the cooperation between Lotus and Ital Design. The heads of these two companies happened to meet by chance on the Maserati stand at the 1972 Geneva show, held in the spring. They had a short conversation about sports cars and then went on their separate ways. 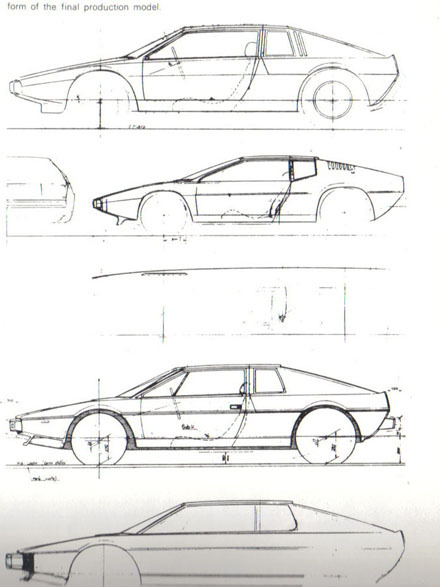 Just one week later Giugiaro received a telephone call from Lotus, a request to accept the commission for the design work on the M50 and M70. 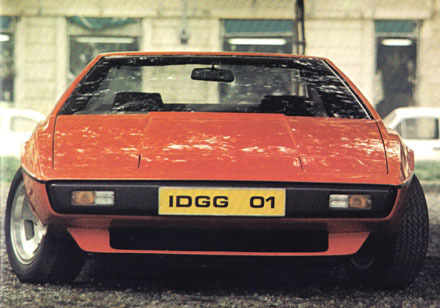 At Lotus the outlined their ideas about the M70, which became the Esprit of course: A two litre mid-engined two-seater, two door car. It had of course to be able to meet all the necessary European and American regulations. Lotus wanted to speed the work as much as possible. The two firms decided to aim at having a model displayed at the Turin show, which was just two months away. Engineers travelled regularly back and forth between Wymondham and Turin, this was found to be a very effective time-saver. To the design staff of Ital Design, the time pressure of the schedule was something new, but the two companies were roused to new levels of enthusiasm by the intensity with which their chiefs threw themselves into this joint effort, and this made it possible for the two teams to succeed in that small space of time. Both companies are very small in scale and both leaders are tough, dedicated men, the best in their field, prepared to work no matter what time it was; one session around the plaster model, for instance, didn’t break up until 3 in the morning. 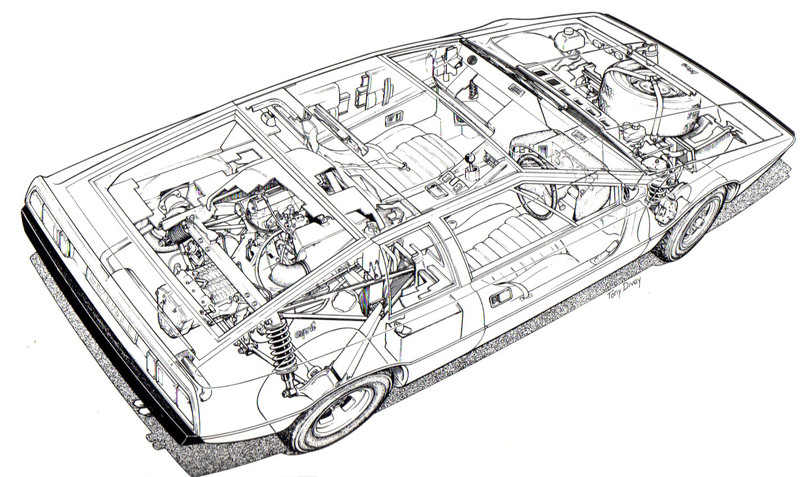 The first exterior presentation from a 1/10 rendering; clearly showing the basic structure of the Esprit; this was adopted. While a ¼ plaster model was being prepared for wind tunnel tests, Giugiaro busied himself with the full-size one. The first problem cropped up during the aerodynamic tests, which gave poor results. Chapman had specified a drag coefficient of less than 0.34., with lift figures of less than 30kg at the front and less than 50kg at the rear. The problem was with the 22 degree rake angle of the windscreen and the rear deck with its fully-shaped window. Complete restudies of the body design were called for. This would delay the program, and mean it wouldn’t be ready for the show. 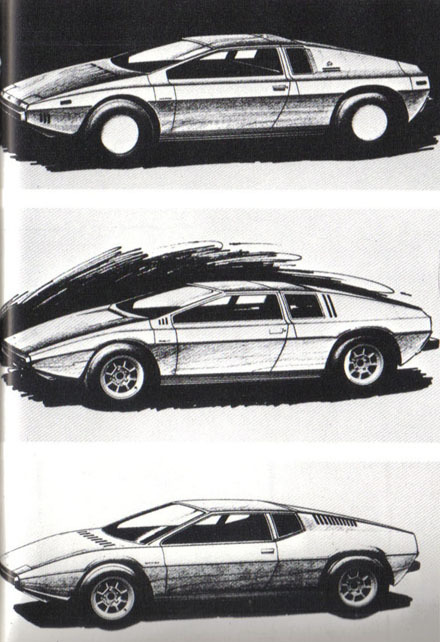 And Giugiaro was faced with the possibility of having nothing on his stand. There was nothing for it but to modify the scale models and run the tests again. Giugiaro spent two days running tests at the M .I.R.A wind tunnel. The result though, was excellent, a drag factor of 0.297. The production prototype shown here was the result of these successful modifications. However, there was not enough time left to prepare a show study, so they proceeded with work on the first model (this was the ’72 Turin show design study we introduced in Car Styling No.2. At present it is in the display hall of Ital Design’s new headquarters). Another prototype was built for Lotus. The Turin study was received very well. After the show Colin Chapman went over the car very carefully, and just requested a change in the windscreen rake angle. This was because his study of the various safety regulations, mainly of America, had led him to the conclusion that a rake angle of 28 degrees was necessary; which he later changed to 26 degrees, but Giugiaro argued that this would spoil the car, and they finally compromised on 24.5 degrees. (Federal safety standards require that when a person sitting in the front seat leans forward, pivoting from the hip line, the windscreen must not be the first thing his head comes in contact with). In general all the initial proposals for the interior design were accepted. The tartan-check seat covers are a nice touch. VW, Fiat and Porsche followed this trend, as is well known. Chapman asked for another inch in interior height for the ’95 percentile man with hat’ to be accommodated comfortably. Again, Giugiaro was able to accomplish this without changing the design. 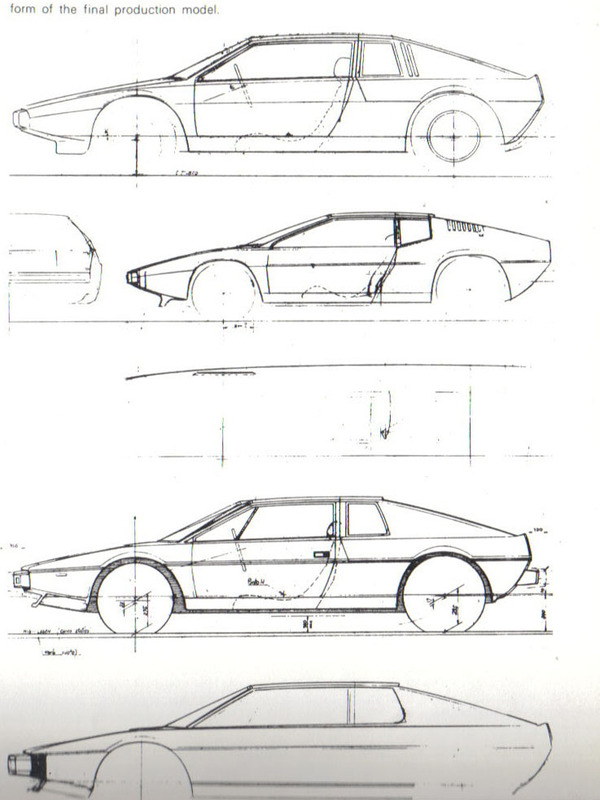 The agreement between Lotus and Ital Design had an important section stating that the Lotus ‘Clamshell’ moulding method be used for the body; this is a low pressure injection moulded glass fibre process. This method is simply like two halves of a shell, an upper and a lower one, bonded along the waistline. This gave the Ital technical staff some problems, but they finally solved it so well that the Lotus engineer, who was controlling the production program, expressed admiring surprise. 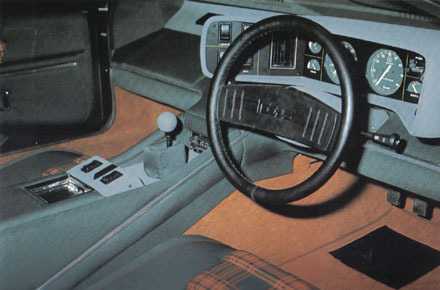 The experience Ital Design gained through this became useful later when they were commissioned to design a similarly constructed car being developed in America by the De Lorean Corporation. As Giugiaro has been commissioned to design a new American sports car, and he is now engaged on the development of the mock-up. The 16-valve DOHC 2 Litre Lotus 907 engine produces 160kph, 5-speed gearbox, naturally, and the top gear is overdrive. Maximum speed is 138mph (222kph). Front suspension is independent double wishbone, with telescopic dampers and coil spring units; rear is independent, drive shaft semi-trailing beam and crosswise link, telescopic dampers and coil spring units. 6J x 14 & 7J x 14 wheels, and Goodyear Gran Prix tires are fitted. The two fuel tanks hold 15 gallons (approx 60 litres) giving it a range of about 450 miles (720 km). 7ft cubed (1982 cm cubed) total luggage compartment space at the front and back. 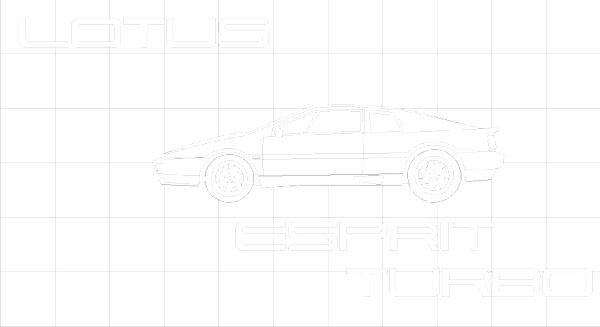 The Lotus Esprit is an example of a car produced by a small group of designers and engineers using their enthusiasm and professional skill to the maximum. We did not have a chance to test this car, but it will prove to be without doubt another example of that elite group of sports cars which include Ferrari and Porsche.